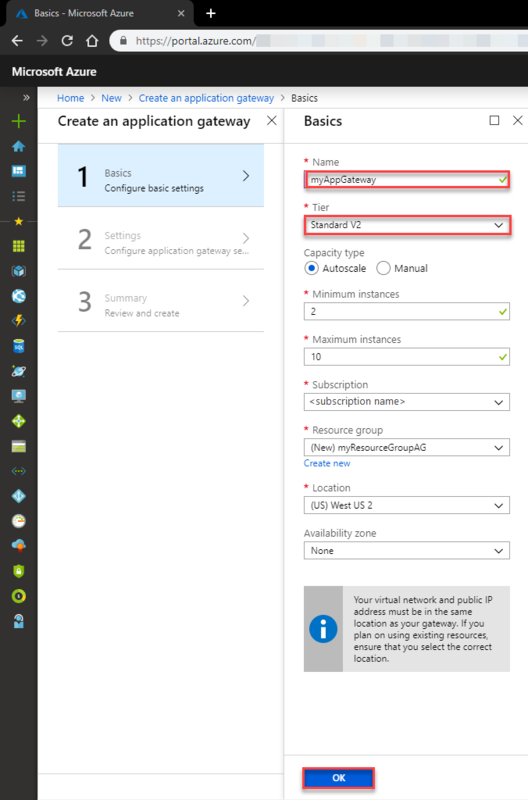 This quickstart shows you how to use the Azure portal to create an application gateway. After creating the application gateway, you test it to make sure it's working correctly. With Azure Application Gateway, you direct your application web traffic to specific resources by assigning listeners to ports, creating rules, and adding resources to a backend pool. For the sake of simplicity, this article uses a simple setup with a public front-end IP, a basic listener to host a single site on this application gateway, two virtual machines used for the backend pool, and a basic request routing rule. Sign in to the Azure portal with your Azure account. For Azure to communicate between the resources that you create, it needs a virtual network. You can either create a new virtual network or use an existing one. In this example, we will create a new virtual network. You can create a virtual network at the same time that you create the application gateway. Application Gateway instances are created in separate subnets. You create two subnets in this example: one for the application gateway, and another for the backend servers. Select Create a resource on the left menu of the Azure portal. The New window appears. Name: Enter myAppGateway for the name of the application gateway. Resource group: Select myResourceGroupAG for the resource group. If it doesn't exist, select Create new to create it. Accept the default values for the other settings and then select OK.
On the Settings page, under Subnet configuration, select Choose a virtual network. Name: Enter myVNet for the name of the virtual network. Address space: Enter 10.0.0.0/16 for the virtual network address space. Subnet name: Enter myAGSubnet for the subnet name. The application gateway subnet can contain only application gateways. No other resources are allowed. Subnet address range: Enter 10.0.0.0/24 for the subnet address range. Select OK to return to the Settings page. Choose the Frontend IP configuration. Under Frontend IP configuration, verify IP address type is set to Public. Under Public IP address, verify Create new is selected. You can configure the Frontend IP to be Public or Private as per your use case. In this example, we will choose a Public Frontend IP. Enter myAGPublicIPAddress for the public IP address name. Review the settings on the Summary page, and then select OK to create the virtual network, the public IP address, and the application gateway. It may take several minutes for Azure to create the application gateway. Wait until the deployment finishes successfully before moving on to the next section. The backend pool is used to route requests to the backend servers which will be serving the request. Backend pools can be composed of NICs, virtual machine scale sets, public IPs, internal IPs, fully qualified domain names (FQDN), and multi-tenant back-ends like Azure App Service. You need to add your backend targets to a backend pool. Create a new subnet, myBackendSubnet, in which the new VMs will be created. Create 2 new VMS, myVM and myVM2, to be used as backend servers. Install IIS on the virtual machines to verify that the application gateway was created successfully. Add the backend servers to the backend pool. Select All resources on the left menu of the Azure portal, enter myVNet in the search box, and then select myVNet from the search results. Select Subnets from the left menu and then select + Subnet. From the Add subnet page, enter myBackendSubnet for the Name of the subnet, and then select OK.
On the Azure portal, select Create a resource. The New window appears. Select Compute and then select Windows Server 2016 Datacenter in the Featured list. The Create a virtual machine page appears. Application Gateway can route traffic to any type of virtual machine used in its backend pool. In this example, you use a Windows Server 2016 Datacenter. Resource group: Select myResourceGroupAG for the resource group name. Virtual machine name: Enter myVM for the name of the virtual machine. Username: Enter azureuser for the administrator user name. Password: Enter Azure123456! for the administrator password. Accept the other defaults and then select Next: Disks. Accept the Disks tab defaults and then select Next: Networking. On the Networking tab, verify that myVNet is selected for the Virtual network and the Subnet is set to myBackendSubnet. Accept the other defaults and then select Next: Management. Application Gateway can communicate with instances outside of the virtual network that it is in, but we need to ensure there is IP connectivity. On the Management tab, set Boot diagnostics to Off. Accept the other defaults and then select Review + create. On the Review + create tab, review the settings, correct any validation errors, and then select Create. Wait for the virtual machine creation to complete before continuing. 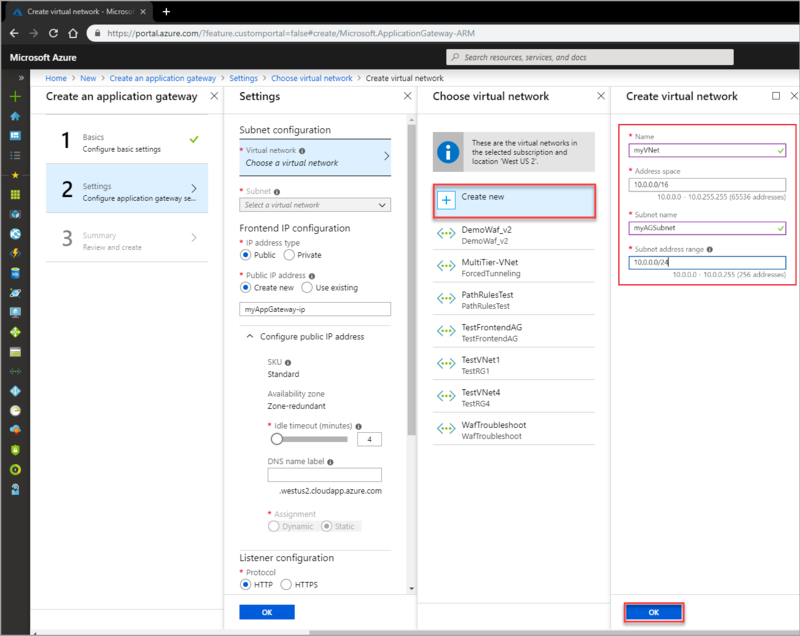 In this example, we are installing IIS on the virtual machines only for the purpose of verifying Azure created the application gateway successfully. Open Azure PowerShell. 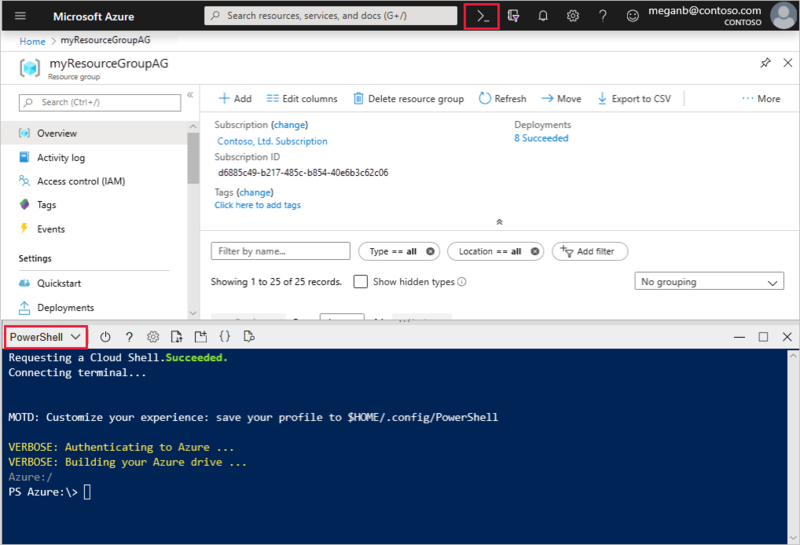 To do so, select Cloud Shell from the top navigation bar of the Azure portal and then select PowerShell from the drop-down list. Create a second virtual machine and install IIS by using the steps that you previously completed. Use myVM2 for the virtual machine name and for the VMName setting of the Set-AzVMExtension cmdlet. Select All resources, and then select myAppGateway. Select Backend pools from the left menu. 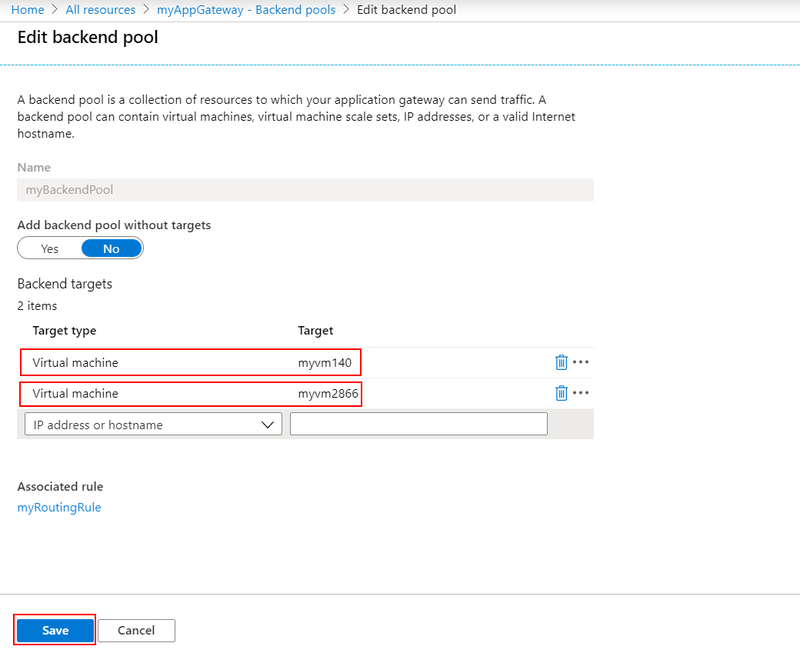 Azure automatically created a default pool, appGatewayBackendPool, when you created the application gateway. Under Targets, select Virtual machine from the drop-down list. Under VIRTUAL MACHINE and NETWORK INTERFACES, select the myVM and myVM2 virtual machines and their associated network interfaces from the drop-down lists. Find the public IP address for the application gateway on its Overview page. Alternatively, you can select All resources, enter myAGPublicIPAddress in the search box, and then select it in the search results. Azure displays the public IP address on the Overview page. Copy the public IP address, and then paste it into the address bar of your browser. Check the response. A valid response verifies that the application gateway was successfully created and it is able to successfully connect with the backend. On the left menu of the Azure portal, select Resource groups. On the Resource groups page, search for myResourceGroupAG in the list, then select it. On the Resource group page, select Delete resource group.